In Iran we are really heading east. The route out of Tehran goes straight in the direction we are heading. We decided to take the longer North-east Iran route to Mashhad so we could avoid cycling only in the desert and heading to the apparently more humid and green Caspian Sea area. We started off climbing and descending up and down along the Alborz mountain range. Then we crossed this range and descended all the way down from 2300 meters to 0 meters. The road was great, although very busy. It was green, there were rice fields and lush forrest. The greatest change was the enormous humidity. Definitely different. Just before the Caspian coast we headed east again, so we never actually saw the sea. We did notice the impact of all the moist. We were wet constantly and nothing dried. We passed Gorgan, the Golestan National Park and after that we were in the desert again for our final stretch to Mashhad. 12 days on the bike. 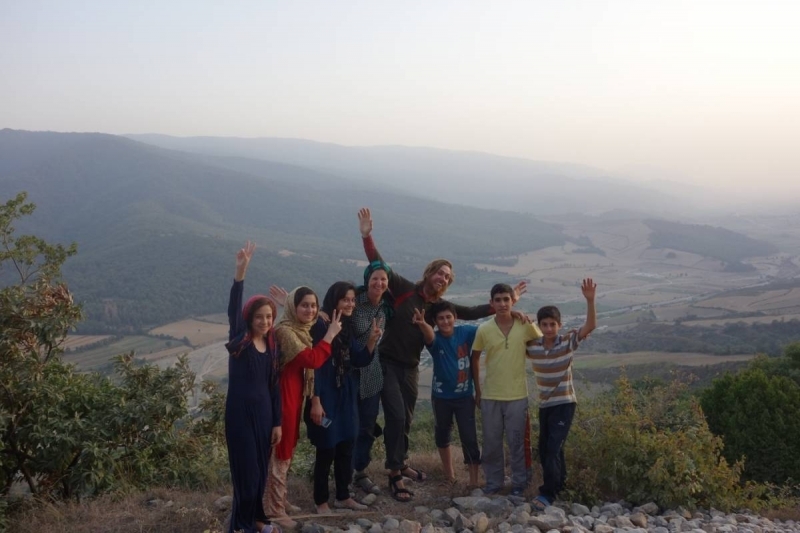 We were lucky that our Warmshowers host Siavash invited us for a tour around Gorgan. We saw a lot of families picnicking in the mountainous forest area. It was amazingly busy! We parked the car and went for a stroll around the area. Siavash is a really funny guy who likes to make jokes a lot and it was nice to be able to relax at his place. He also took us up on a hilltop for a nice view of Gorgan. On the way to Golestan National Park, which we were looking forward to, we were stopped by Mansour. He invited us home. We had to think about his offer because it would mean we would cycle less than planned but decided to stay with him. He lived in a small village just before Tang Rah with his family, two brothers and a sister all in different houses and their children. He stimulated three 16 year old daughters of the family to practice their English while Martin was playing volleyball with the boys of the family. Mansour took us up to a mountain for tea during sunset. A really pretty quiet place. We were very happy staying with Mansour and his family. He would also like to host other travelers. If you would like to stay with him you can contact him: mansour.saidi1@yahoo.com or phone number +989119965695. After the village of Tang Rah the national park really starts. People warn not to sleep in the park because of cheetahs but we saw many Iranians camp as well. The chance of seeing wildlife so close to the road is very minimal anyway. The park is very nice but it is not being kept very well. In a lot of places there is garbage and they are still overcoming floods from 15 years ago. Also they are wanting to expand the road running right through the park. Not so good for preserving the fauna and wildlife…. In the park there is a tunnel and on the other side of the tunnel the climate changes dramatically. It goes from forrest and jungle to desert within a few kilometers. Amazing! From then on we would climb another steep hill before reaching Bojnurd and before starting our slow and kind of boring descent to Mashhad. Luckily we had a tailwind which saw our speed going up to 40 km/h during quite a long stretch. We did three 100 km+ days in a row also to get our bodies used to the distance because we will be making similar distances in Turkmenistan. We are almost at the end of Iran. The attention from people is still very intense. When we stop at a resting area it only takes seconds before we are surrounded by many people asking the same questions. People stare at us while we eat and watch every movement we make. Guys on motorbikes slow down to be able to ride longer behind the western woman on a bicycle and stares from cars are very frequent. People are in general very friendly but there are always odd ones out. Now we are in Mashhad, a city most Iranians visit because of the Holy shrine of Imam Reza. We have not visited the shrine yet but will in the following days. 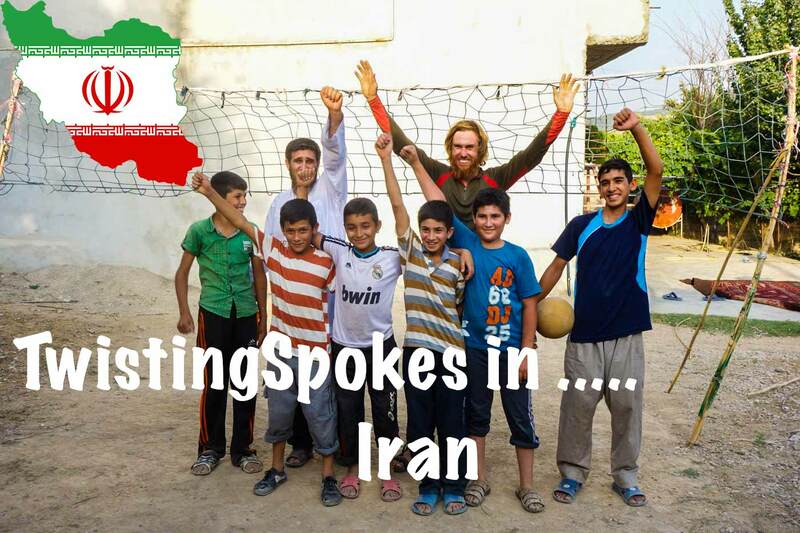 It is really an important place for most Iranians and we were asked if we were heading there by a lot of people. Iranians travel during their summer holiday. We have seen many many white cars with luggage on the rooftop on the roads. On the way they also camp and picnic. 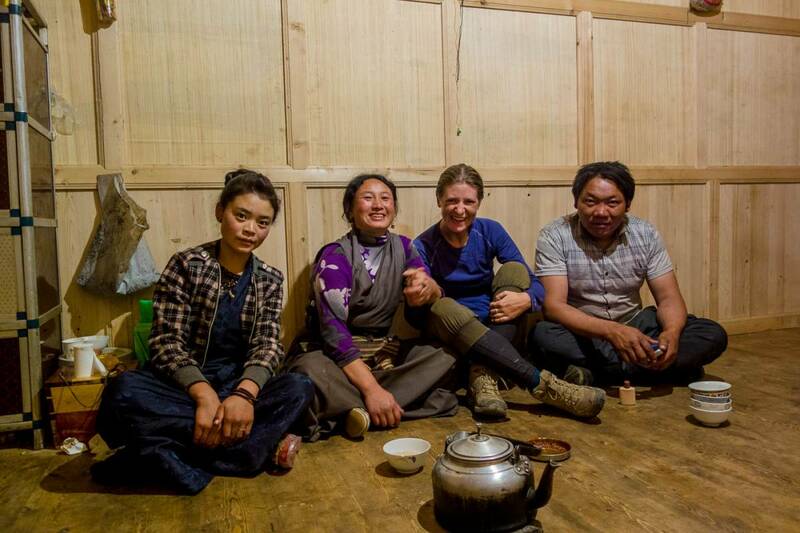 We are always surprised that they camp and picnic in areas that we would never choose: as in straight next to the highway and in overcrowded city parks. We prefer the quietness of orchards outside the city which have worked perfect for us. 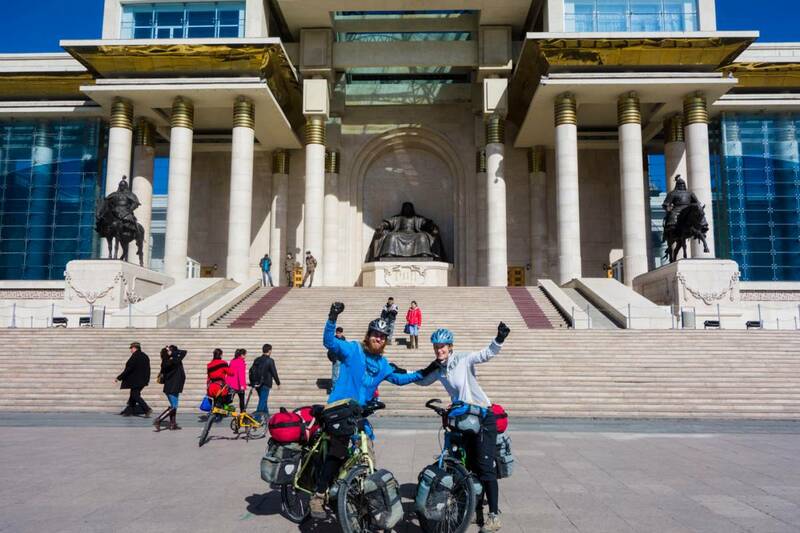 We did get our Turkmenistan visa here together with a Mongol Rally team from Taiwan. We are staying at Valis non smoking guest house which is a smiple place where many other travelers go, here we met David a great guy 3 years on the bicycle on his way home see his website http://www.71degresnord.canalblog.com/! David was lucky in an unlucky moment when leaving Mashhad he was hit by a car luckily he managed to jump away and was unhurt, Trafic here in Iran is a real danger so we are doing our best to be careful! In a few days we will cycle the final stretch in Iran and prepare for the desert dash in Turkmenistan. We are looking forward to the Stan’s. They are getting very close now! For our route of North-east Iran see map below. Hi .lm rahman – you meeting me in iran in golestan wher are you now ?how are you and your waif. l cant faind you in map. Mmm happy new yer and bye…. Really enjoy my armchair travelling! Love the photographs and your writing. So great hearing from you. It sounds so interesting and adventerous. We all really admire what you are doing. Lots og thoughts from Kolding.